In all spiritual traditions, light is a symbol for goodness and love. As human beings, our purpose is to increase the amount of light in the world. And there can be no question that with the challenges this past year has wrought, now–more than ever–we need light. Hanukkah is called “The Festival of Lights” and the central ritual of Hanukkah is lighting candles for eight nights in a hanukkiah, a nine-branched candelabrum. 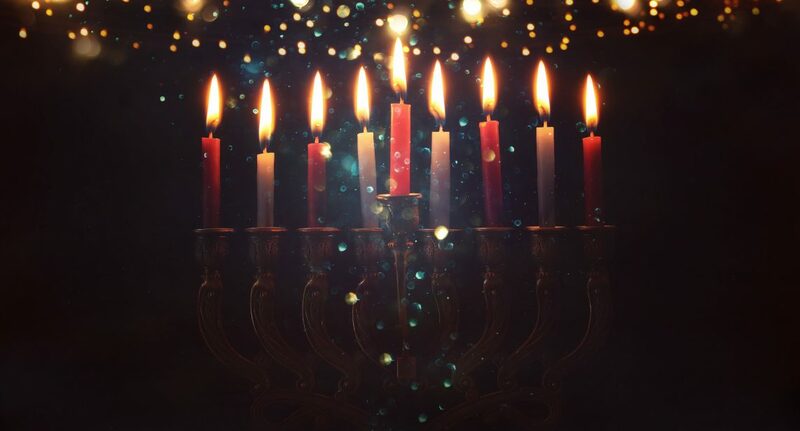 The ninth branch is for the shamash (helper candle) that lights all the others. The lighting of the candles is symbolic of the one-day worth of oil that lasted for eight miraculous days when the Maccabees rededicated the defiled Temple in Jerusalem. The story we tell on Hanukkah is that this scant supply of oil that should not have been enough to keep the menorah lit was, indeed, enough. Which brings us to today. Recent circumstances may have left us feeling overwhelmed and incapable of making a difference. We too may not feel “enough.” But consider the shamash. Alone, it emanates a small glow. Then it lights one candle, and another and another, until, on the eighth night, our homes are aglow with the warmth of multiple lights, reminding us that together, we can bring more light into the world; we can illuminate the darkness and repair the world’s brokenness. Because whatever our beliefs, whatever festive days we celebrate, this is a time to rededicate ourselves to increasing light: for our families, for our communities, and throughout our world. Happy Hanukkah! We wish everyone a joyous holiday season.